Hi there! I’m Leia. I am from Eat It & Say Yum and am SO excited to be a new contributor here at The Love Nerds. 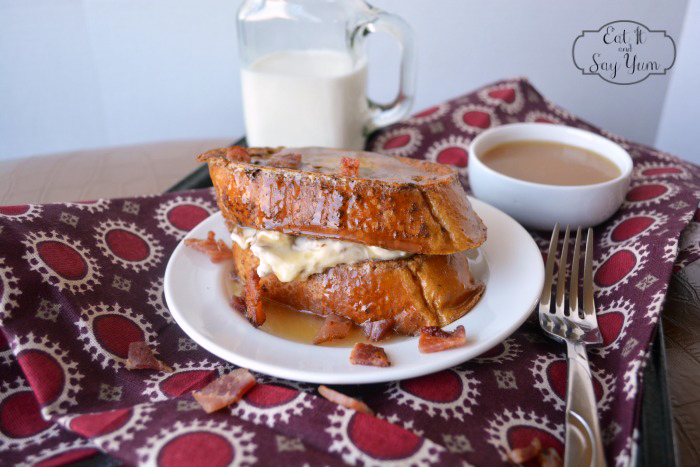 Today I want to share my Maple and Bacon Stuffed French Toast with you. I don’t remember getting the memo, but apparently French Toast is all the rage these days. Which is fine with me because, hey, it’s delicious! For this recipe you start with bacon. It HAS to be good if I am telling you to start with bacon… Right?! Get the bacon nice and crispy, then chop, or crumble, 4 pieces. 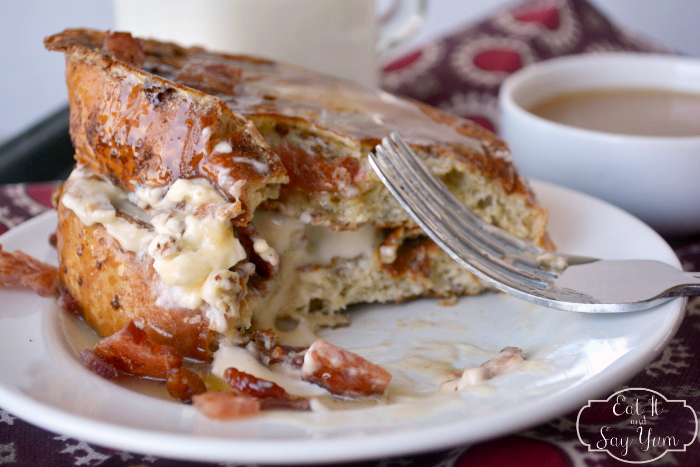 The filling is made with cream cheese, maple syrup, and the crispy bacon. Super simple, but all ingredients that pack some great flavors. Beat the cream cheese til fluffy, then beat in the vanilla. Use a spatula to fold in the bacon next. I like my french toast with a little crisp to the edges. So once my skillet it about ready, I rub some shortening on it. That fries the edges just a little, and I think it’s perfect. When preparing the egg dredge for the french toast, I beat the eggs and half of the cinnamon together first. That powdery cinnamon has a tendency to fly all around, but the eggs help hold it together. Add the nutmeg and vanilla, mix again. Then mix in the milk. Reserve the second half on the cinnamon. After you have dredged the first 4 pieces of bread and they are on the griddle, then mix in the second half of cinnamon. When you stop stirring the egg mixture, the cinnamon tends to float to the middle and it sticks to bread, which is good and bad. You want cinnamon on the bread, but you want it to last until the last slice, too. So that is why I add in the second half after dipping the first four slices of bread. So the last slices have cinnamon, too. Also, let each slice of bread soak in the egg mixture for at least 10 seconds. You want the eggs and milk to really soak up into the bread. Then cook the bread for a few minutes on each side with your griddle at about 325 degrees. Or medium heat on the stove. Each side should be golden brown and a little crisp. 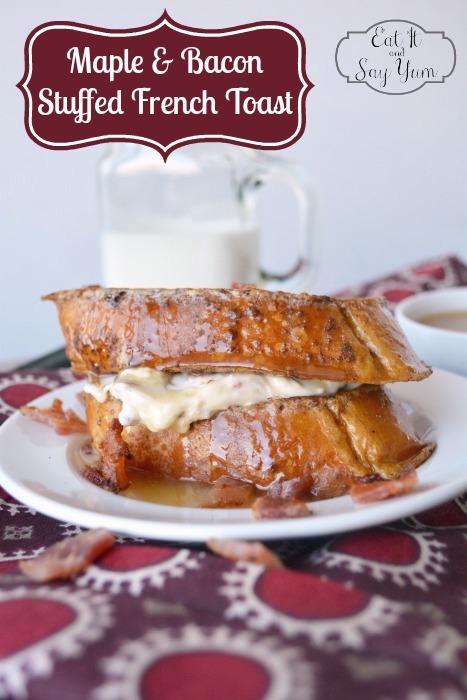 Then spread some of the cream cheese mixture between two slices and top with your favorite syrup. I love Buttermilk Syrup, it’s amazing! Cook bacon til crispy, then crumble or chop into small pieces. Beat the cream cheese til smooth, then beat in the maple syrup. Test the flavor, add more syrup if desired. Fold in the crumbled bacon with a rubber spatula. Set aside. Preheat griddle to 325 degrees, or on the stove at medium heat. Cut 8 slices of French bread. In a pie pan, or 8x8 baking dish, crack the eggs and add ½ of the cinnamon. Mix carefully with a fork. When cinnamon is mixed in add the vanilla and nutmeg and stir again. Add the milk and stir. Grease griddle with shortening. Dip two pieces of bread at a time into the egg dredge. Let them sit for 10-15 seconds before turning them over to repeat on the other side. Place the soaked bread onto the hot griddle. Repeat with two more slices of bread. Add the remaining cinnamon to the egg mixture and repeat process with last four slices of bread. Cook for 2-3 minutes per side. Adjust heat if necessary. 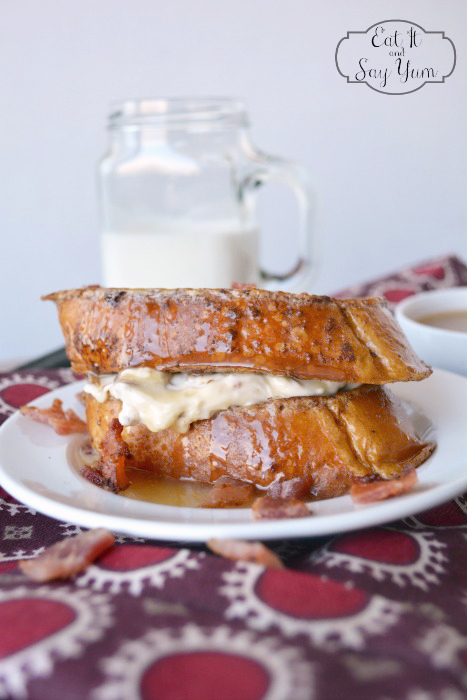 Spread about ¼ cup of the cream cheese mixture between two slices of the French toast. Top with powdered sugar, jam, or syrup. Eat while still warm. I hope you can take a minute or two to visit my site and follow me on your favorite social medias, like Facebook or Pinterest. Plus, you could always subscribe to receive my future posts via email. Looks like a delicious breakfast to me!! 🙂 Especially when you’ve added the bacon. Nothing better than bacon! Love your site! check out my site sometime! 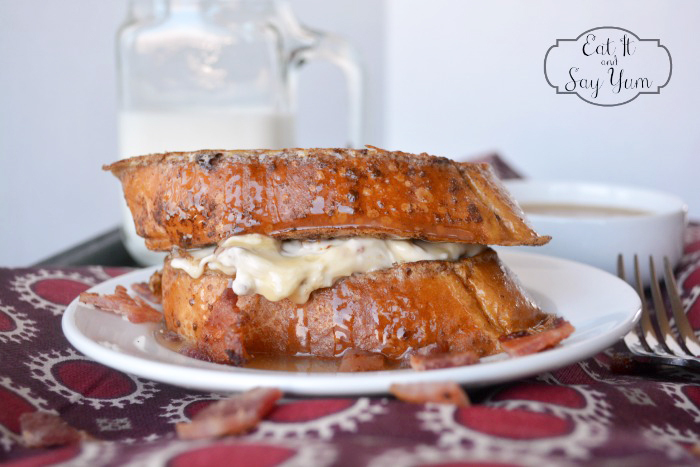 When I make a big breakfast, I usually prefer sweet things, but this savory dish sounds amazing! You just can’t go wrong with bacon. I agree, you can’t go wrong with bacon! The sweet from the syrup goes great with the saltiness of the bacon. This looks so, so, so good! I can’t wait to try it! Holy yumminess!!! Sounds like a pretty fantastic breakfast to me!! Thanks so much for sharing at The Wednesday Roundup! Have a great weekend!! Wow this looks like something I need to make ASAP! I am pinning as I type! 🙂 Thanks for linking up, excited to follow you! Thanks, Morgan! I hope to share more great things in the future, thanks for following! This looks amazing. It would be yummy on Easter morning. Yes, Krystal, perfect for Easter! There’s a place where I live called Donuts on the Square. It’s a gourmet donut place with square shaped donuts, and they have a maple bacon one that is the best seller. My husband loved it. 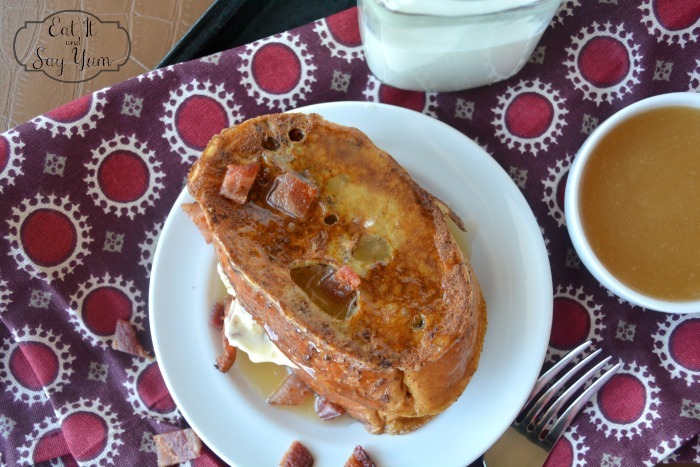 I bet he would love this french toast, too. It looks amazing! G’day! A breakfast sugar high indeed! Reminds me of childhood! This is screaming my name. Pinned! Holy bananas… are you serious right now! I am craving something… bad. I was about to go sneak a cookie.. and now I am craving this amazing concoction! WOW, that looks crazy good! Thanks, Dawn. I always crave sweet and salty, and this is a great combination of both of those. Enjoy! OH MY GOSH! My mouth is watering–yes! This looks incredible!